The Times and Sunday Times Good University Guide is an essential tool that gives you all the information you need to make the crucial decisions on what to study, where to study, and how much it might cost. 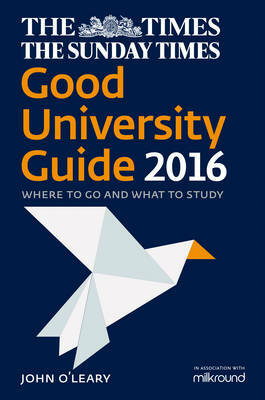 Objective and authoritative, it is the best-selling guide to making the right university choice for you. For 23 years The Times and Sunday Times Good University Guide has provided the most accurate and up-to-date information about British universities to help make the choice of which universities to apply to as easy as possible. Its university and subject league tables are the most respected and studied in Britain. This definitive guide is designed for those who are applying to start courses in 2017. a How to select the right course and university, including advice on employment prospects. a Universities compared in a league table and university performance assessed in 66 subject tables. New subjects for this year are Animal Sciences and Creative Writing. a Clear guidance on the application process. a Comprehensive overview of tuition fees, fee waivers, bursaries, grants and loans as well as advice on living costs. a Extensive profiles of over 130 universities including the most recent institution to gain full university status: St Mary's University, Twickenham. a Detailed information on finding somewhere to live and on university sports facilities. a Advice for those considering studying overseas and those wishing to come to Britain to study. Written by John Oa ™Leary, former Editor of The Times Higher Education Supplement, this is the most authoritative guide available.